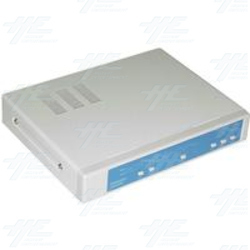 NTSC / PAL digital multisystem converter which converts any video signal to NTSC or PAL. Offers premium conversion quality. Turn your old 50/60" amusement screens into PAL televisions or obtain broadcast quality NTSC / PAL / etc... conversion. Y/C input and output provides best conversion picture. Convert any video system to any other video systems. Adjustable control on Contrast, Brightness, Color, Tint.